The objective of these assemblies is to provide APPA members to bring forward any changes / demands in our S18 collective agreement for the 2020 provincial negotiations. In order to ensure that all members have an opportunity to voice their opinions, we have selected two dates and in two different locations (one East and one West). The topics of discussion and agenda will be the same for both meetings and as such you are invited to attend either or. 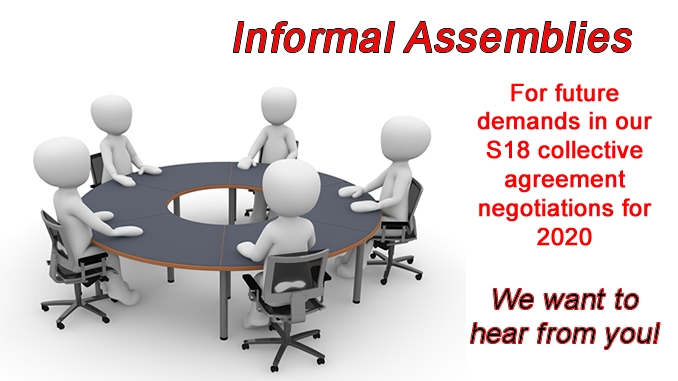 We often have members that express concerns or issues with certain working conditions and encourage you all the come and share them with us so that we can bring them forward to our negotiating team. It is essential that we hear from you and have a clear understanding of these issues / concerns. The time is now! For complete information and schedule, click on “More Information” below.